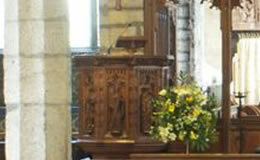 HI I'M THE CHURCH MOUSE, MY FAMILY HAS LIVED IN THE DARTMOOR CHURCHES FOR HUNDREDS OF YEARS. WE KNOW EVERYTHING THERE IS TO KNOW ABOUT CHURCH OBJECTS AND I'M HOPING WE CAN HELP YOU TO BECOME A REALLY GOOD CHURCH DETECTIVE. BEFORE YOU START THE PRACTICE ROUND DO YOU WANT ME TO TEACH YOU A LITTLE MORE ABOUT THE OBJECTS YOU FIND IN CHURCHES? GREAT LETS GET STARTED THEN, CLICK THE 'NEXT OBJECT' BUTTON WHEN YOU WANT TO MOVE ONTO THE NEXT ONE! Look at the carvings on that! 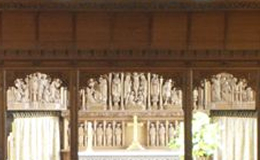 The medieval carvers lavished some of their finest work on church screens. The screen divided the sacred part of the church from the rest of the building. REMEMBER, NOT ALL THE OBJECTS LOOK THE SAME IN EVERY CHURCH. Who’s looking at you? High up in the roof of a church you might find pairs of eyes looking down at you. Kings, saints, green men and animals can all be found on roof bosses. Medieval Devon churches often had wooden roofs decorated with roof bosses, most commonly swirling flowers and leaves. MY GREAT GRANDMOUSE SAW HARRY HEMS WORKING ON A BENCH LIKE THIS I THINK, ALTHOUGH IT WAS MANY YEARS AGO! 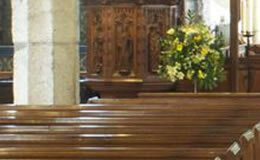 Many Devon churches have beautiful wooden benches or pews. They were first introduced about 500 years ago but many were replaced or repaired by the Victorian church restorers like Harry Hems. 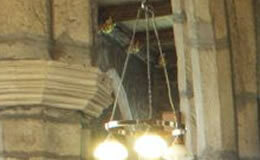 THESE OBJECTS CAN VARY GREATLY, BUT YOU KNOW THAT BEING A GREAT CHURCH DETECTIVE! 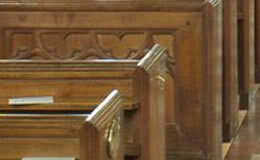 The pulpit gives the priest a raised position from which to preach to the congregation. It was often decorated with carvings. EVERY CHURCH HAS ONE OF THESE, HANDY FOR SCURRYING BEHIND! 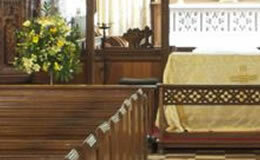 A stone or wooden table that is the centre point for many church services. It is usually found at the east end of the church. 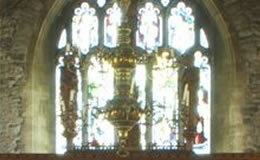 It is often covered with a decorated cloth and holds a cross and candlesticks. THESE ARE QUITE RARE, BUT THEY GIVE ME A GOOD VIEW OF THE CHURCH! 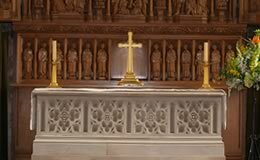 When benches were first introduced into churches around 500 years ago they gave another surface on which the wood carvers could display their skill. You can find scenes from the bible, bishop’s heads, animals and even monsters carved on the end panels of benches. The walls of some churches are lined with wooden panelling. It helps keeps the cold out if nothing else! The colourful painted glass windows of churches often show scenes from the Bible. When the light shines through them they act as illuminated wall paintings. NOW YOU KNOW LOTS ABOUT THE OBJECTS YOU CAN FIND IN CHURCHES IT'S TIME TO PLAY THE PRACTICE ROUND.